At this time you must be invited by one of our site administrators. Contact us to request an invitation. International orchid exhibition. The Botanical Gardens are adorned with species of the Colombian national flower brought to you by national and international growers. International festival of poetry sponsored by Prometeo magazine, poets from five continents come to Medellin to share their work with the public. Annual Tango Festival – Last week of June. Colombia MODA – The most important annual fashion event in South America, presenting around 450 Colombian and international exhibitors in the Centro Internacional de Convenciones Plaza Mayor in Medellin. Visitors are expected from all over Latin America, Europe, the United States and the Far East. The Medellin Flower Fair / La Feria de las Flores – The centre of Medellin bursts into flames of color and a delicious bouquet of sweet smells during the Flower Festival, the city’s most important cultural event. Colombia is famous for its flowers and exports them all over the world. This annual celebration has been going strong since 1957 and is always held during the first two weeks in August. A 53 year old tradition in Medellin that lasts for 10 days. Antique auto parade, Cabalgata (horse parade), desfile de los silleteros parade, arts, crafts, concerts, botanical and orchid displays and more. The whole city is in party mode for the entire time. International Horse Fair – Welcoming thousands of equestrian activities, this fair confirms Medellin as one of the equestrian capitals of the world. The Festival of Christmas Lights / Los Alumbrados de Navidad – The Christmas lights decorating Medellin make it the most beautiful Latin American city in South America over the Christmas holidays. The lights are illuminated from mid December to mid January. The most impressive parts are centered around the Rio Medellin at the ‘puente de Guayaquil’. Large statues made of lights can be found throughout the city. The Medellin River, La Playa Avenida, Nutibara Hill and other parts of the city put on one of the most spectacular light displays in the world. Every year the theme changes. There are reviewing stands all along the river where the largest displays are open to the public for viewing. The Gardens contains a wide variety of trees and flowers. Known for a spectacular orchid display, which is a must see for the flower lover. The Public Utilities Company of Medellin, (EPM) is the proud sponsor of the Medellin Interactive Museum. The Museo de Antioquia, located in the heart of Centro, is one of the most popular museums in the city. Pictures, sculptures, photographs plus other forms and works of modern art created by Colombian and international artists. U of A is regarded by most Colombians as the most prestigious University in Colombia, and at the very top in Central and South America. The Palace has four floors, a center courtyard and rooftop observation area. The ground floor houses the art gallery, the archival library, and the museum book store. Only 17 Km from Medellin is a beautiful park and nature preserve which serves the recreational, camping, and educational. The famous artist, Fernando Botero was born in Medellin. The plaza dedicated to him is full of his memorable sculptures. It is an interesting plaza for people watching and enjoying the weather and full of great photo opportunities. It is located in the center of the city and a great place to spend an afternoon. Located in the center of the city, Bolivar square is a great place to pass some time. It is a refuge of shade surrounded by great restaurants and shopping. There is often live music in the park so visitors can hear traditional Colombian Vallenato or listen to Tango. The square is a traditional landmark of Medellin, built in the mid-19th century. The Metropolitan Cathedral is impressive behind a fountain at the end of the square. Also in the square is the Lido Theater which was recently restored. It is a great place to get a feel for historical Medellin. Get off the very safe Metro and change to one of the cable cars that brings you up to the comunas. While I would not recommend getting off the cable car at any of the stations that lie in the comuna 13 sector, the line that goes to the Santa Domingo gives you access to the Spanish library and connects further to the amazingly beautiful Parque Arvi. Positioned at the top of the mountain in Medellin is the Biblioteca España. The ultra modern designed black library is located in the northern part of the city in a neighborhood called Santo Domingo Savio. Three massive non symmetric geometric buildings house informational library resources for Medellin’s citizens. Instead of serving as passive repositories of textual and book knowledge the buildings main focus is housing a myriad of programs, resources, and services dedicated to all ages with an emphasis on small children. Access to the library and to the neighborhoods above can be reached by taking another one of the city’s landmark attraction – the Metrocable. A new ambitious project just outside of Medellin that will create one of the largest nature reserves in the region. Parque Arvi sits on the eastern edge of the city and can be accessed by both the metro cable and vehicles and buses alike. The countryside appeal of the lush green fauna is not only spectacular to experience, but forms an important watershed for the area as well as important biological nature reserve for plants and animals native to the area. In addition to the Parque Arvi metro cable, the area can be reached by public transport from Medellin via the buses that service Santa Elena. Private automobiles are also allowed in the reserve. 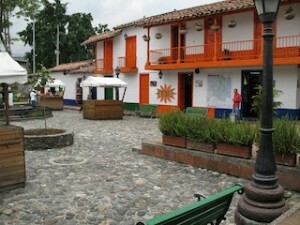 Pueblito Paisa is located on the top of Nutibarra Hill (Cerro Nutibarra) in Medellin. This replica of a typical turn of the century Antioquia town comes complete with its traditional stone fountain in the middle of the town square and is surrounded by the church and rectory, the mayor’s office, a barber shop, and a one-room school house. Pueblito Paisa is an icon to the people of Antioquia. This attraction is a fun way to get a bird’s eye view of the city and surrounding mountains and valleys, as well as get away from the bustling city below for an hour or so. Located in El Centro, the Bibloteca EPM is fine example of futuristic styling blended with functionality. The Planetarium is at the foot of the metro station Universidad, and is a project of ITM, the Instituto Tecnologico Metropolitano. There are 19 public holidays per year in Colombia. There are also a number of official bank holidays when many businesses are closed.